ARINGOLI D., GENTILI B. 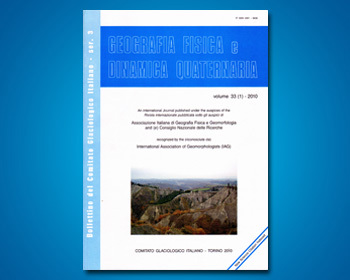 & PAMBIANCHI G.
The Authors describe a detailed geomorphological investigation of a part of the right-hand slope of the Fiastrone stream (right tributary of Chienti River) deformed by evident mass movements, whose evolution could have affected the stream, which is occupied by an artificial basin. The analyzed area is located on the roof unit of the Sibillini Mountains thrust and includes the formations belonging to the Umbro-Mar-chean sequence, which shows a complex plicated setting structured by the compressive tectonic phase extending from Tortonian to Lower Pliocene, and then resumed in Upper Pliocene. Calcareous, marly-calcareous and marly sediments of the Lower Lias – Oligocene, affected by different joint sets, crop out. Some of these (shear joints) correspond with the field of compressive stress and are compatible with the plicated structures trending mainly N160°-180°E, N80°-100°E, and N40°-60°E, subvertically. The analysis allowed the Authors to hypothesize a recent reactivation of the compressive structures occurring, however, by inversion of kinematics; besides, they also observed disjunctive elements of recent genesis such as extensional joints and high angle normal faults to which are associated modest individual displacements (decimetric), but with a notable general lowering trending mainly N140°-160°E and N60°-80°E. In this stratigraphic-structural setting, there developed gravitational phenomena of different typologies responsible for the continuous modelling of the studied slope; the prevailing movements are represented by translational slides and by subordinated collapses; mountainward, the slope has been affected by an imposing phenomenon of deep-seated gravitational deformation. Favorable conditions for this kind of phenomena were the rapid and general uplifting of the area (very intense from the end of Lower Pleistocene) and, in the related hydrographic pattern, a downcutting which generated high relief values; the activation of mass movements is probably connected to particularly intense seismic events, both past and recent; in fact, in connection with the 1996 seismic sequence, fractures have been revealed in the upper part of the slope. The shear planes and/or zones are located in the mainly marly levels of the Marne a Fucoidi formation and, at some points in the tectonized band observed in the Scaglia rosata limestones. Moreover, an important role both in the activation and kinematics of the movements, seems to have been played by the presence of disjunctive elements created by recent tectonics and/or connected to normal reactivation of ancient compressive structures. A further aim of the present work is to evidence the high hydrogeolo-gical risk represented by the artificial basin of the Fiastrone, which in extreme climatic conditions could interfere, or above all with high intensity seismic events, could interfere with the active or quiescent mass movements, and lead to a possible landslide evolution of the deep-seated slope deformation of Mount Frascare.